The evolution of digital advertising is moving forward at a staggering pace. The evolution of technology is directly proportional to the changes which impact the technology. This has been the case from the initial transition of digital advertising from television to the internet space. In the current day and age especially the digital ad world is one of the high market cap industry. Digital advertising expenditure worldwide that include computers as well as mobile devices such as smart phones and tablet stand at an estimate of $194.6 billion in 2016. This estimated figure is predicted to constantly increase in years to come, reaching almost total of $335 billion by 2020. The mobile device advertising platform is one of the heavily invested sectors in digital advertising industry. The mobile internet platform is predicted to increase from an estimate of $109 billion in 2016 to well over $247 billion in 2020. Mobile ad spending in the U.S. alone is projected to double between 2015 and 2019. We at dJAX develop Ad Server Software products that enables internet Publishers, Advertisers, Ad Agencies and Ad Networks to effectively run and report on their online advertising campaigns on Display, Mobile and Video platforms. 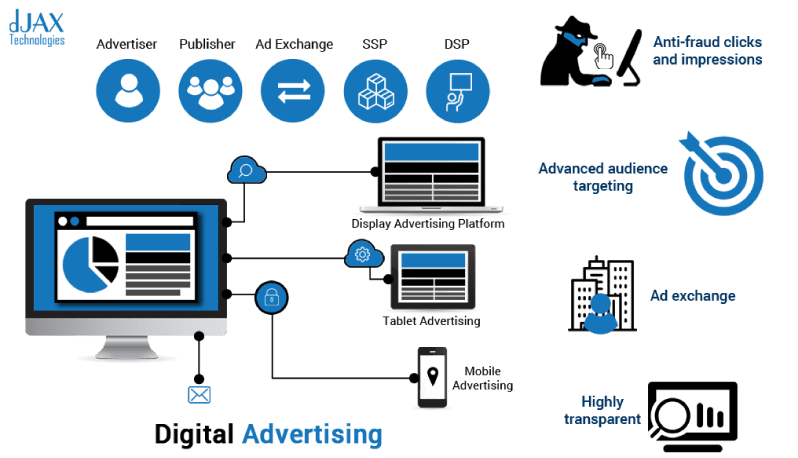 With a team of highly skilled professionals in scripting Ad Server Technology and best in class organizational setup, we aim at developing Ad Server Software that deliver the best Ad Server Solutions to meet every requirement of your online ad serving needs. - First 3 months free support.